Where is Dow Jones Industrial Average heading ? 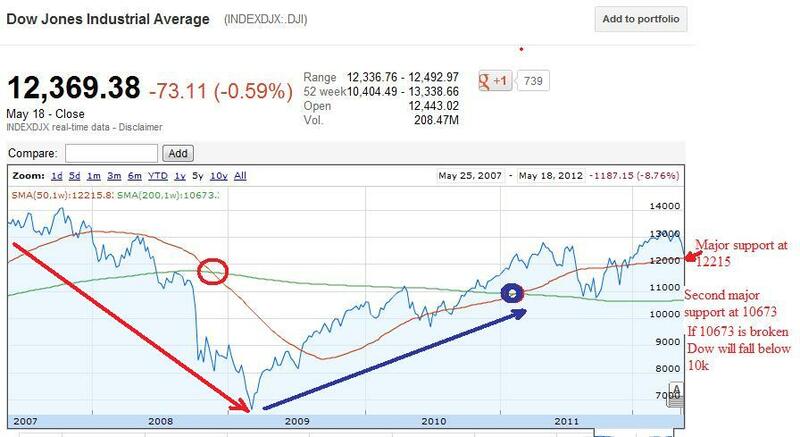 So far all the gains made between January 2012 - May 1st 2012 has been wiped out and Dow is sitting at Jan 6th level at 12,369. Dow was well ahead of where it should be with the slow US recovery. Ideally it should be below 12k with Fed supporting this market with QE1, QE2 and operation twist. Without Fed intervention, Dow should be at 10k level. For the first time in 2012, S&P500 VIX June future is expensive then July future which means VIX can rise very sharply with any bad news. Dow Jones has now entered into crash zone after wiping out 969 point in just 3 week. This market likes to go in opposite direction of what majority thinks. In December when everybody was fearing of France downgrade, Greece default, Eurozone recession, US slow recovery and China Slowdown, this market rallied and the stock market was in overbought zone for more then 4 month. This market was saved by ECB 1 trillion with 2 LTRO operation. Now majority thinks this market could bounce back after sell off, so do you think it will bounce back soon? I think next week we should have consolidation in Dow between 12,215 and 12570 before its goes up or down depending on ECB or FED policy. This market cannot go higher without QE3, or LTRO. 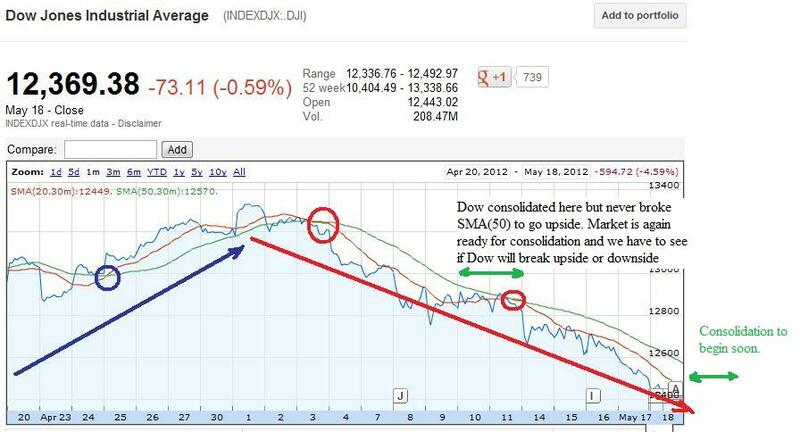 Lets analyse Dow chart and see where its heading. 5 year chart of Dow shows major crash can happen if Dow breaks 12,215 but it would stop at 10,673. If 10,673 is broken then welcome to part 2 of financial crisis, but this can only happen if Greece exit Euro zone. 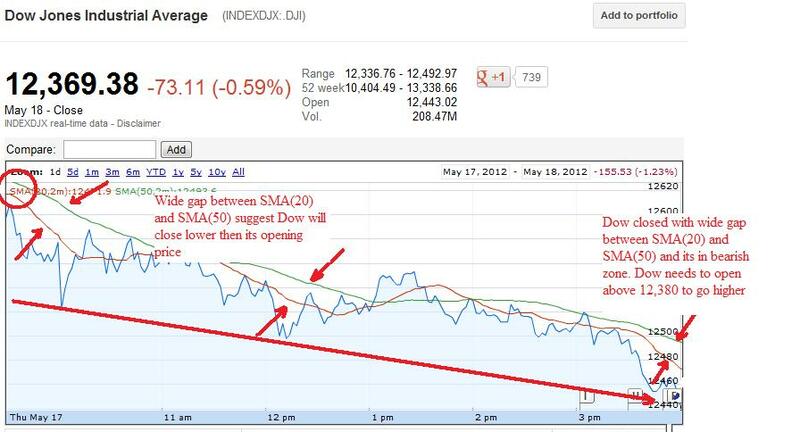 Watchout June 17-18th, its make or break day for stock market. 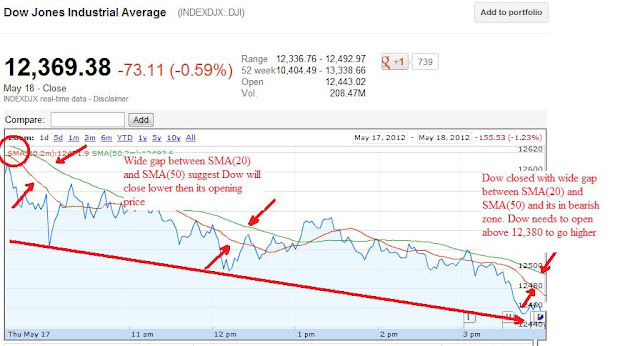 May 18th, Dow closed at 12369 in a bearish zone with wide gap. Dow needs to break 12380 to go higher while if Dow breaks 12,332 to go downside. 1 month chart of Dow, shows its time for consolidation and if Dow can break 12570, it will go higher. Next week is very important for stock market as it will be consolidation time and dow will settle down after sell off. Dow has very big support at 12,215 followed by 10,673. If Dow breaks 12,215 then its going lower, if Dow breaks 12570 then its going higher. This market is definitely not good for long term investor as its end up flat every quarter. Look for quality beaten stocks in this market, e.g. AAPL, PCLN, MA, V, CVX, CAT, QCOM, AET, ORCL, POT, MOS, HAL. You should make your own buying list during sell off. There are few ETF which have rallied in past like ERX, TNA, and FAS. This market hasn't bottomed yet. Look for the clues from Europe especially Greece, Spain. Also, watchout US dollar index, its safe to invest if it falls below 81. Don't put all your eggs in one basket. Majority of the investor didn't had cash to take advantage of 2008 crash. So start consolidating your cash. Let this storm of Greece and JPM be over and then start investing. If you invest in a right stock at right time, you can make tones of money in this volatile market. Just have some patience.